Wherever you decide to set up camp you’ll be glad to have this fantastic Firestarter Bracelet Survival Kit! This high-quality kit includes 11 tools and gadgets that are ideal for a variety of emergency situations, you never know when an emergency can occur especially when you’re outdoors camping so you’ll be glad to have this survival kit with you. Amongst the survival kit’s contents are: fishing line, weights, tinder, fishing lures, floats, an alcohol pad for sanitizing wounds, safety pins, swivels, a metal scraper, a flint rod and a paracord wrapping that covers 12 feet once unravelled. Despite all the tools and gadgets included in this set it’s still compact and lightweight so it’s easy to carry around and store when not in use. Wherever you’re camping you’ll be glad to have this kit with you. 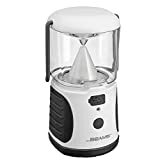 Available in both green and white these powerful camping lanterns are going to make a great addition to anyone’s camp site. Each lantern is powered with a three powerful LED lights that can easily fully illuminate an entire room, plus with two settings you can adjust the light to a dimmer setting if you prefer a calmer more relaxed lighting. The lanterns are built to be very tough and are fully weatherproof and water resistant. And don’t worry there will be no need to replace the bulbs with these powerful lanterns as all you need to do is replace the batteries. And each lantern will easily provide 30 hours of illumination and if having a wondrous strong light source wasn’t enough with these powerful lanterns you can also charge your smartphone, iPod or even your tablet thanks to the USB charging port on the front of the lantern. Say hello to the power of the sun with this incredible solar powered charger! It’s lightweight and portable and can be used with a large variety of electronic equipment including smartphones and tablets. 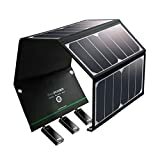 Backpackers, hikers and any other kind of campers can easily take this portable charger with them on their travels as it weighs only 754 grams. And don’t think that just because it’s a solar charger that it won’t power your products because this excellent, high-quality solar charger features premium solar charging cells that have been shown to increase your charging efficiency by up to 23.5% and if that wasn’t enough it also features smart technology that can automatically detect your optimum charging power. When we plan for a stay outdoors, whether it’s camping, hiking, backpacking or any other outdoor activity one thing we often forget to include in our plans is the fact that we’ll probably have cold hands. 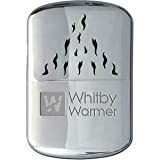 Cold hands can be the result of many things and they can really dampen our day, but with this wondrous Whitby hand warmer that won’t be something you’ll have to worry about any more. This hand warmer is quick and simple to set up and use, all you need to do is fill it with lighter fluid using the included filling cup. With a maximum heating time of up to 12 hours and with its own fleece carry bag this hand warmer is going to be an essential camping accessory that everyone will need. A roaring campfire is one of the reasons we all love camping so much in the first place isn’t it? But setting a camp fire isn’t always easy but with this EDCC fire kit you’ll have a beautiful warm fire in no time at all! This compact and lightweight fire lighting kit is simple and easy to use and will guarantee you a beautiful campfire in any weather. This EDC fire kit is easy to store and can even be attached to your key ring for easy and quick access. The kit comes with everything you need to stay warm in the outdoors including waxed jute Tinder sticks and fire powder and it evens includes a storage compartment for matches and its own match striking surface. IDEAPRO personal water filter with you you’ll never want to go camping without it again! 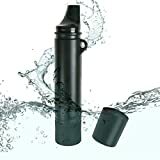 With its high-quality double filtration system this water filter is a guaranteed way to drink safely wherever you are! This wondrous water filter fully complies with the FDA food contact test and can fully eliminate 99.9% of contaminants. This portable water filter can safely filter up to 1500 litres of water and can be safely used with water from many sources including rivers and reservoirs. This great kit includes everything you need including: a foldable water pouch, water pre-filter, backwash device and an extension tube. This amazing survival blanket from Highlander is sure to keep any camper warm even during harsh weather! The silver survival blanket is made with reflective foil that is specially designed to keep your body heat in and features extra foam padding that will help keep you comfortable and relaxed. When fully rolled out this stunning survival blanket measures 2m x 1.4m in length and can be rolled back up and carried with the added handles easily. When rolled up the blanket is only 38 x 15cm and lightweight so hikers and backpackers can easily carry it with them on their travels and store it away when not in use. The fantastic four inch blade of this glorious Gerber Bear Grylls folding knife is going to be an essential tool for any camping trip! You’ll never know when you need a good knife and this compact, folding knife will always offer a reliable cut. It also comes with its own sheath so you can easily clip it on to your belt. The blade features a 1/2 serrated high-carbo stainless steel pointed blade which is ideal for slicing cleanly through a variety of materials including tough thick rope. But the blade isn’t the only amazing thing about this knife, the textured rubber grip on the handle will mean your hand will always be comfortable while you hold and use the knife and it also features a locking system that will ensure that you’ll always be safe when the blade is folded away. This magnificent mini survival tin includes everything you could need in case of an emergency! Wherever or however you’re camping with this mini survival tin you can ensure that you’ll always have what you need. Despite its huge contents and variety this mini survival tin is still incredibly lightweight and compact so you can easily take it with you on your travels. So what does this marvellous mini survival tin include? What doesn’t it include would be a better question, it includes everything you could need including: an emergency light source, whistle, liquid filled compass, water carrier, alcohol swab, 1m paracord, compressed towel, surgical tape, glow stick, a variety of fishing equipment and even a mini-sewing machine. Emergencies and situations of all kinds will be covered with this amazing survival tin. it’s completely non-toxic. It can hold up to 750ml of water and is fully leak-proof so you can run, hike, climb and much more without the risk of losing your water. 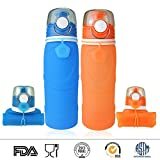 This strong and ultra-durable water bottle is completely eco-friendly and designed for quick and easy use. You can even hook it onto your backpack, belt or luggage! This bottle is ideal for all sorts of usage and would make a great camping accessory that you’ll always be glad to have with you. A good high-quality backpack is going to be something you’ll treasure forever and this magnificent Mil-Tec Military Army Patrol MOLLE Assault camping & hiking backpack is everything you could possible need! With a total capacity of 36 litres you can fit everything you need in this amazing assault pack. The pack is made from high quality 600D polyester and it’s also PVC coated, it features two separate main compartments and two front pockets as well, so you’ll have all the storage you need. Empty this pack only weights 1400 grams so it’s ideal for long distance travellers, hikers, campers and much more. exactly an option is it? But thankfully with this terrific multi-functional outdoor tool from Topist you won’t need to! This amazing product is 7 tools in one and can do everything you could possibly need it to. This tool can be a: hoe, saw, nail-puller, pickaxe, shovel, bottle opener and even a compass! Whatever your needs this multi-tool can do it all and it comes with a comfortable easy grip rubber handle so no matter what you’re using it for this multi-tool will be comfortable and secure in your grip. The tool also comes with a carry pouch so you can easily attach it to your belt or backpack. Camping Gas Bottles – Which Cylinder is Best?